For Blue Valley, the top of the mountain is within sight. The defending Kansas Class 5A champions moved one step closer to the 2011 pinnacle Friday night, knocking off Gardner Edgerton for the second time in four weeks, this time by a 34-14 score. That Blue Valley is headed back to Emporia and the State title game is due in large part to the effort of the Tiger defense, which once again held Gardner Edgerton’s talented tailback Traevohn Wrench relatively in check, minus one big early TD run. There were very few weaknesses in the Tiger offense either. Senior quarterback Kyle Zimmerman again led Blue Valley, statistically and by sheer will. He had 17 carries for 164 yards, most of it on the read option, while keeping his team calm in the face of several big plays. He scored three TDs on the ground and threw for another, and helped his team convert on three fourth downs and led the Tigers to an unofficial 17 first downs. Blue Valley tailback Justin Fulks, playing at nearly full strength for the first time in weeks after overcoming a nagging ankle injury, had 131 yards on the ground of his own, 80 of it coming on the Tigers’ opening play from scrimmage in the second half – a touchdown burst down the far sideline, directly in front of the Trailblazer bench, that gave his team an insurmountable 20-point advantage at 27-7. The teams traded scores over the game’s final 20 minutes to lead to the final outcome, but it was the first and third quarters of this one that really told the tale. Gardner Edgerton grabbed the initial lead before most fans had even settled back into their seats after the kickoff. The Blazers took just three plays and 24 seconds to cover 80 yards, capping the speedy drive with a 58-yard burst by Wrench. Seconds later, GE had the ball back, courtesy of a well-executed onside kick that found the Tigers still reeling from the blows the Blazers had just delivered. But after a 10-play drive, Gardner turned the ball over on downs, with a sack and a penalty effectively ending the march after it had reached the Tiger 20-yard-line. “We really needed to score the second time we got the ball,” Diener said. It was all Blue Valley from that point on, as the quick-strike Tigers scored the half’s final 20 points on three nifty drives. The first Blue Valley score came on a 16-yard scamper from Zimmerman to cap a 6-play, 42-yard march that tied the game at 7-7 with just over two minutes left in the opening quarter. Blue Valley’s second scoring march started very late in the first and went into the second, with Zimmerman again putting the ball into the end zone, this time from just a yard out. The 12-play, 39-yard drive was classic, old-school football at its best. It was then time for Blue Valley to recover one of its own kickoffs, a pop up kick that the Tigers battled to grab – and got – at the Gardner-Edgerton 26. It was a play Diener pointed to as Gardner’s “only bad mistake” of the night, but it soon would allow the Tigers to grab a two-score edge. Six plays and 1:58 after the onside kick of sorts, Zimmerman hit Sean Skaggs with a five-yard TD strike and it was 20-7 after the missed extra point. That’s where it stood at the half. After the intermission, Fulks had the second big touchdown dash of the contest, matching Wrench’s first quarter TD run with one of his own that was a thing of beauty. “It was tough (on us) for them to score on the first play of the third quarter,” Diener said of the Fulks TD. Tough indeed, when coupled with the fact that after the game went to 34-14 when Zimmerman went 40 yards for his third score of the night on the ground, Blue Valley ripped off a drive of 8:51 that ate up nearly all of the final quarter…and any chance the Trailblazers would have for a comeback. 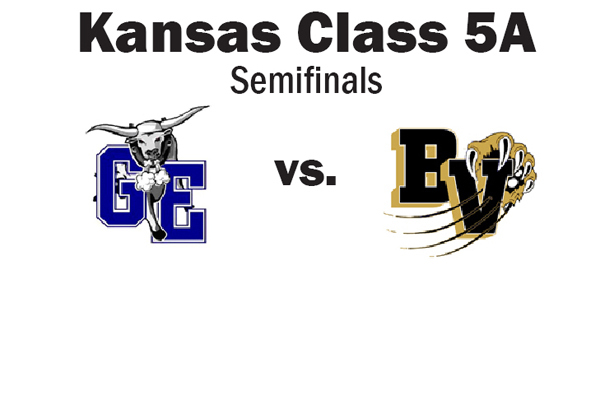 Gardner Edgerton ended its season at 8-4, while Blue Valley advances to Saturday’s title game in Emporia vs. Hutchinson at 11-1.